Is the pain in your jaw a TMJ disorder or is your jaw simply tired from overuse? The answer to this question is important because if your jaw is just tired, you can recover by eating softer foods, massaging your jaw joint, and avoiding TMJ stressing activities such as yelling, yawning, or singing for a few days. If you have a TMJ disorder, you have to get to the root of the problem and correct it in order to find long-term relief. In fact, you may find out that the genesis of the problem isn’t even in your TMJ but rather in your neck. We will discuss that more toward the end of our article. For now, let’s consider TMJ symptoms that will let you know if your problem runs deeper. Jaw pain – The temporomandibular joint (TMJ) attaches the lower jaw to the skull on both sides of the head just about an inch in from the ear. The first indicator of a TMJ problem is pain in this joint. The pain may also radiate toward the ears or down into the neck. Jaw noise – Another common identifier of a TMJ problem is a popping, grinding, or clicking sound when you open or close the jaw. Keep in mind that this sound does not always indicate a serious problem, but that it is a common symptom. Also, it is important to note that the sound may cease, but the underlying issue and the pain may continue, so the ceasing of jaw noise doesn’t always indicate that your condition is better. Limited range of jaw movement – Your jaw may be too painful to move all the way, or it may lock. This includes both ways that the jaw can move, as a hinge joint and as a sliding joint. Inflammation – You may note some facial swelling around the jaw joints. Ice is a good way to reduce swelling. Remember that heat will send more blood to the area, and this will mean more swelling. So avoid heat if your jaw is inflamed. Ear issues – Many people find that they also suffer from ear problems when dealing with moderate to severe TMJ dysfunction. The proximity of the jaw to the ear can be part of the problem. You may suffer from tinnitus or more frequent earaches and infections. Face pain – The TMJ is located very close to the trigeminal nerve which branches to provide feeling across the face. Therefore, you may have problems with pain in various parts of your face depending on the degree of the TMJ problem and whether it is irritating the facial nerve. Headaches – Headaches may become chronic while suffering from TMJ pain. This may be particularly true if you also have pain that radiates toward the neck since neck pain and headaches frequently go hand in hand. 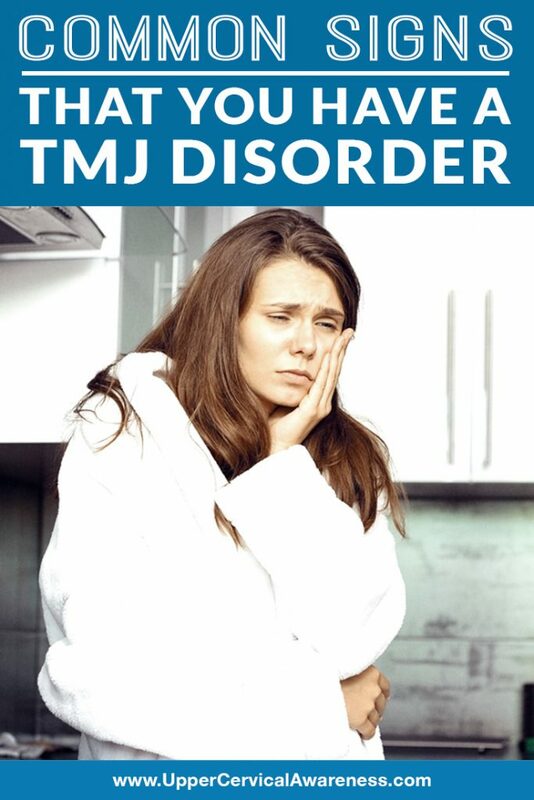 Sleep disturbances – Besides the fact that the jaw pain or headaches may keep you awake, there is also a prevalence of sleep apnea among TMJ dysfunction patients. Another underlying factor regarding sleep is bruxism (grinding of the teeth). If you find that your jaw is the sorest when you first wake up in the morning, stress may be involved. Neck stiffness – Neck pain is one of the most common symptoms that come along with a TMJ problem. This is because the underlying cause of the jaw pain may actually be in the neck. Whether it is due to stress (which the body stores in the neck and shoulder muscles) or past trauma, it is important to correct this underlying problem. How is the neck related to TMJ pain and how can you find long-term relief? We will look at this link closely to provide a natural solution. An upper cervical misalignment may be at the source of chronic jaw pain. How is this possible? Consider the location of the atlas (C1 vertebra). It is directly between the jaw joints and ears. So it makes sense that a misalignment in this area would affect these other parts of the body. For example, the atlas balances the head. Therefore, even a fraction of a millimeter of misalignment will cause the surrounding soft tissue to shift in order to keep the head on straight. As a result, those changes in surrounding tissue can affect the alignment of the jaw, the Eustachian tubes that drain excess fluid away from the ears, and even the facial nerve, leading to trigeminal neuralgia (face pain). How can this misalignment be detected and corrected? This is precisely what upper cervical chiropractors are trained to do. This chiropractic subspecialty doesn’t involve any of the popping or twisting of the neck that you may associate with chiropractic in general. Instead, precise measurements of the C1 are taken to offer precision corrections with gentle adjustments. For some patients with TMJ pain, this has resulted in long-term relief from chronic pain, headaches, and other symptoms. If you are suffering from recurring jaw pain, contact an upper cervical chiropractor near you. It may be that a misalignment is the underlying cause of the problem. If so, gentle adjustments can set you on the path to better overall health and well-being. Schedule a no-obligation consultation with a practitioner in your area today.